My bathroom has a small vanity area. The perfect spot for a great vanity bench. Problem is, I don't own a vanity bench, and I've never been able to locate one for a price that I wanted to pay (i.e. cheap). But I love to sit while I do my hair, or sit while I brush my teeth--because I like to read while I do these things. Am I the only one who reads while she brushes her teeth? Lacking a cool vanity bench, I've perched on various things. Recently, though, I dragged a tired old chair from my attic and decided to turn it into a vanity seat. 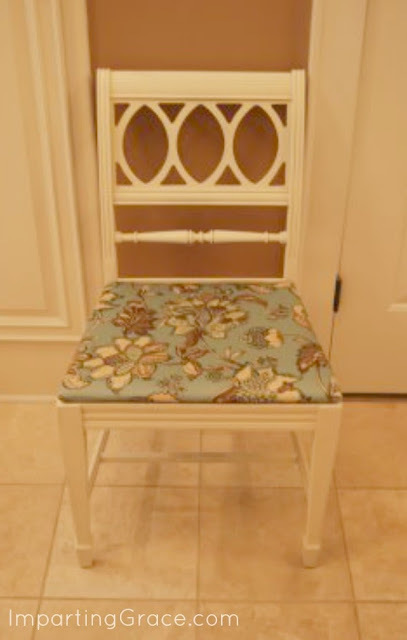 I simply sprayed the frame with Rustoleum Heirloom White spray paint and then used some leftover fabric from the bedding I made this spring to cover the seat. The chair is a perfect fit for my vanity space. Maybe I can sit here, brush my teeth, and read about how to take better pictures. I like it! I think it's better here than it ever was in my dining room. What do you think? Shared with Susan at Between Naps on the Porch for Metamorphosis Monday. 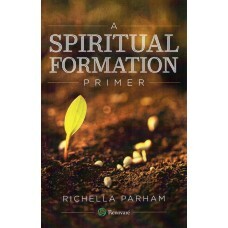 Check out all the fun transformations! 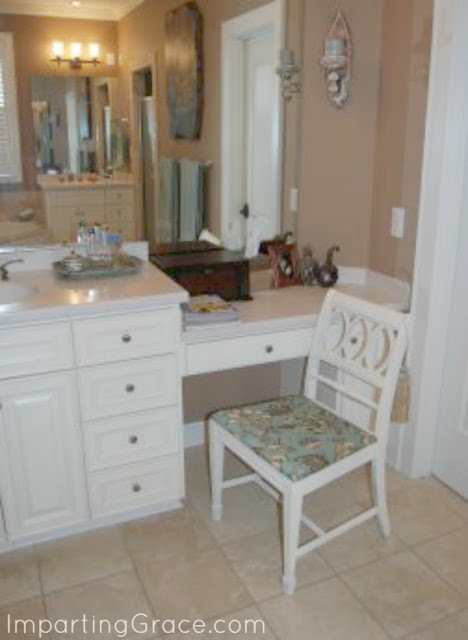 Your chair looks beautiful as a vanity chair...you did a great job...love it! And yep, I've been known to read while brushing my teeth, too. :-) Richella, I don't currently have the Met Monday or Tablescape Thursday buttons with code...but that's a great idea! I'll try and work on that sometime soon...thanks for the suggestion! I have to get some heirloom white! I also envy you that you have a spot to brush your teeth and apply makeup and read!!! It was meant to be, being just the right height and all. I have never thought of reading while brushing my teeth-funny because I read while doing everything else. Wow, just think, I can get another paragraph or two in now! That is an adorable chair redo! Beautiful and looks so perfect for your vanity ! Youd really did a professional job ! What a great chair makeover! Love it! Oh - that little chair is so sweet! I would love a bathroom with a spot for a chair. Great job! Great job! Looks so nice with your vanity. I love the chair and what you did with it. It's perfect for the vanity chair! I love it! You have a King Midas touch. I love it! When we built our house two years ago, I hadn't even thought about a vanity that has space for me to sit, and I should have because I LOVE to read while I am drying my hair which takes forever!!!! What a great chair. I love the back design. Love the title of your blog. You DO know what you are doing with your chair transformation! It is perfect in your bathroom! Maybe I should read while I brush and floss--I'd brush longer! Richella, how perfect is that chair!! I love it painted white and that fabric is sooo pretty! You did a great job on it! Yes, I own The Tightwad Gazette. I used to subscribe to her newsletter before she had the books! I re-read it every year, not for the ideas, because some are so outdated. But just because she's inspiring in that she always looks for alternatives and she really thinks about her purchases! 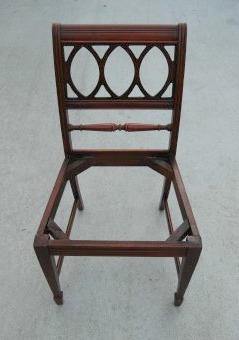 What a pretty little chair. Shows itself well in white. Looks like a perfect vanity chair to me! Nice job on the chair... I really love the detail of it too... so cute for a vanity chair! Stop by my blog for my 100th post giveaway if you get a chance! LOVE, love, love that chair! It looks like it was made to got right there in that little vanity nook. Oh...and the fabric is DIVINE! Where oh where did you find it? I am looking for something similar for my bathroom vanity. What a coincidence! Thanks for sharing. Michigan oh I love that state. We lived in Mt Pleasant for 20 years. I am also a red head. Very cute chair. It seems perfect for your project. Come on over to my blog and see what I did with the lamp that you sent me! Love that chair and I love that fabric! I love the egg-like design on the back of the chair:) good job! Hee Hee! Heirloom White spray paint is my favorite! Great job. I love your bathroom and your lovely little chair. Great job! I love chair transformations - yours is beautiful! It looks lovely. and if I could figure out how to read while blogging...I'd be in heaven. that is a great chair and i love it white, great job!